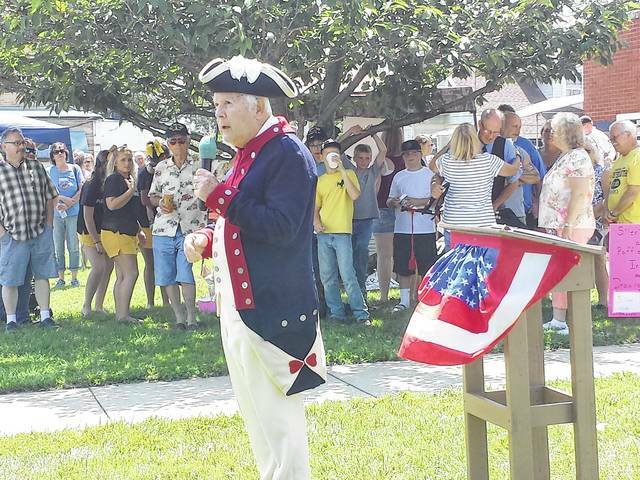 During last year’s Bloomingburg Community Day, Robert Grim spoke at the Bloomingburg Town Hall during the Veterans Memorial Dedication Ceremony about a few of the village’s veterans who impacted the community after their service. The deadline for craft vendors to sign up for the sixth-annual Bloomingburg Community Day is quickly approaching. The annual Community Day will be held on Aug. 12 from 11 a.m. to 8 p.m. and organizers said recently they still have room available for vendors. The deadline to sign up as a vendor for the event is this Friday. If interested in bringing crafts to the Bloomingburg Community Day, contact Lorie at (740) 437-7556, Tom at (740) 606-7102 or Gayle at (740) 437-7820. This year the event will feature a day full of attractions. The village of Bloomingburg will have community-wide yard sales, a lottery tree, 50/50 raffle, silent auction, guessing jar, bake sale and a baby contest for newborn-3-year-olds. A raffle is also being held (tickets are $10 or three for $25) with a new Husqvarna Zero-turn mower as the prize. A portion of the mower was donated by Green & Sons. Karaoke will be held from 12:30 until 2:30 p.m. and Taking Back Summer (formally Rock N Country) will perform from 6 to 8 p.m.
Bloomingburg native Kathy Bee (Woodfork) will also return to perform during the day from 3-5 p.m. Her career expands over 40 years, which includes winning awards, performing nationwide in concerts, writing songs and books, musicals, charting Billboard, appearing on TV shows, producing and hosting 250 TV shows all while raising two children. Kathy Bee said in a recent press release that the hardest part of her career was leaving home. Finally, a car show will be held from 4-8 p.m. and the cost is $10 to register a vehicle. Goody bags will be given to the first 20 entries, 20 car and truck trophies will be awarded, three motorcycle trophies will be awarded and many door prizes will be available to win. This event is sponsored by Advance Auto Parts, Auto Zone, Ben Stage Metal Roofing, Bloomingburg Spring & Wire, Carroll Halliday Ford, CJ Pony Parts & Performance, The Berry Family, Doug Marine Motors, Green & Sons, Gusweiler GM & Toyota, Hazelwood Painting, O’Reilly’s, The Sergent Family and Cochran Farms. Final registration is at 7 p.m. and for more information contact Bill Blake at (614) 554-6031. Volunteers are needed and anyone who would like to volunteer can contact Lorie at (740) 437-7556, Tom at (740) 606-7102 or Gayle at (740) 437-7820.
https://www.recordherald.com/wp-content/uploads/sites/27/2017/07/web1_BobGrimBBCommunityDay2016.jpgDuring last year’s Bloomingburg Community Day, Robert Grim spoke at the Bloomingburg Town Hall during the Veterans Memorial Dedication Ceremony about a few of the village’s veterans who impacted the community after their service.